The Occam TR embraces the title of trail bike by truly offering the rider the versatility to be able to conquer all trails. With its 120mm of travel and 29” wheels, the Occam TR easily rides over terrain that would leave other bikes trembling. The Occam TR’s trail tuned geometry provides consistent and proportional stack and reach measurements, guaranteeing that every rider experiences flawless handling in a svelte, fun and fast bike regardless of frame size. The Occam TR H30 is loaded with a host of components that will allow you to tackle all types terrain from twisting singletrack to technical downhills. The SRAM NX Eagle 12-speed drivetrain is efficient, offering the gear range that will allow to spin your way up steep climbs and attack wandering singletrack. The 130mm Fox Float Performance fork helps to smooth out the trail chatter keeping you firmly in control. Mach 1 wheels wrapped in Maxxis rubber spin fast and smooth providing you the traction to confidently ride in a variety of trail conditions. When it comes time to slow things down, Shimano hydraulic disc brakes will get you stopped on dime under all conditions. Topped off with an Orbea/Race Face cockpit and dropper post, the Occam TR is sure to provide you with many miles of smiles. Hydroformed triple butted aluminum frame with 120mm of travel. SRAM NX Eagle drivetrain with 12 speeds and huge gear range. Fox Float Performancce suspension fork with 130mm of travel. Internal cable routing maintains a sleek appearance. Shimano hydraulic disc brakes are powerful and reliable. 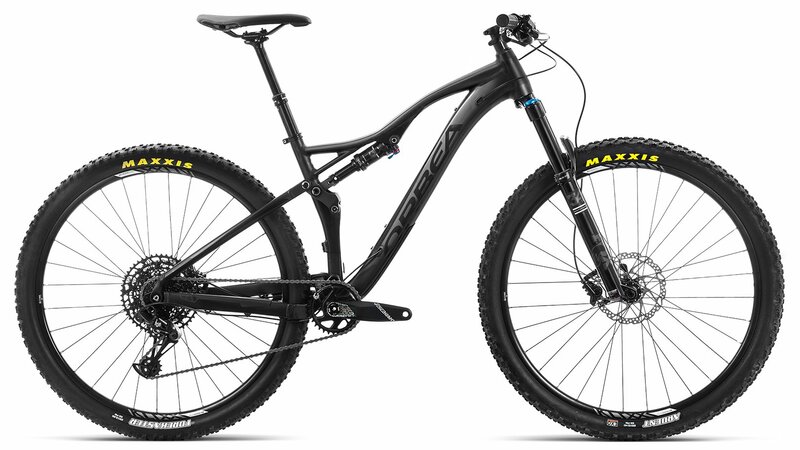 Compatible with 27.5+ wheels and tires to conquer more demanding terrain.